It’s awfully early to refer to the 2015-16 season as the “halcyon days” of the Dallas Stars’ forward depth, but here we are. The Stars’ forward talent pool dried up a bit over the summer. Colton Sceviour, who battled for ice time on Dallas’ fourth line last season, is now flourishing in Florida. Unhappy Valeri Nichushkin took his talents back to Russia, where he’s posting the sort of numbers (14 GP, 5g-6a-11pts) Stars fans and management had hoped to see in Big D. And fan favorite Vernon Fiddler signed with the New Jersey Devils in order to keep living his NHL dream. The club’s greatest strength last season is facing a tough test now: Mattias Janmark will probably not play this season. Cody Eakin is likely out until mid-November. Thursday night, head coach Lindy Ruff said he hadn’t seen flu-ridden Jiri Hudler in “five or six days,” and once he was healthy, the Czech winger would need another four days or so to get back into game shape. The Stars lost two more forwards Thursday night. Patrick Sharp left the game early in the second period following a hard hit from Los Angeles Kings defenseman Brayden McNabb. Later in the second period, Patrick Eaves was slow to get up after inadvertently blocking yet another teammate’s slap shot. He also left the game. Friday, Sharp was placed on injured reserve with “concussion-like symptoms.” Eaves skated briefly Saturday morning, but left the ice prior to the Stars’ morning skate. That’s a far cry from Dallas’ projected lines at the start of training camp, just one month ago. For the Stars offense to keep producing at a high level, the top players must do more. So far this season, they’ve come up short. 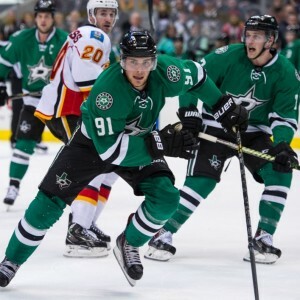 Dallas’ “big three” forwards, Jamie Benn, Tyler Seguin and Jason Spezza, have all been slow out of the starting gate this season. Ruff moved Spezza from second-line center to wing on a line with Roussel and Faksa and is pleased with the result. Benn and Seguin are a different story, however. …we’ve got some guys that are overplaying some situations trying to get just a little too cute. I didn’t see that in Nashville but I saw it at home. For me, it’s that we want to be a little bit fancier at home and we’ve got to clean that up. Per Corsica.hockey, Benn and Seguin are averaging 5.92 and 5.59 scoring chances for per 60 minutes (SCF60), respectively, this season. Those numbers put them eighth and ninth among the 13 forwards to play for the Stars thus far. Their early-season struggles are undoubtedly due to injuries. Benn had abdominal surgery back in July and was handled with kid gloves through September, appearing in just two preseason contests. Seguin, meanwhile, suffered a hairline fracture of his heel in a World Cup of Hockey exhibition game and missed the entire preseason. Since May 11, the pair has played just four games together, all since October 13. Both are trying to shake off the proverbial rust and re-establish chemistry – tasks normally completed in preseason – while playing games which count. An injury-depleted Dallas team desperately needs their superstars playing at 100 percent. With seven of their next nine games coming against Central Division opponents, the stakes are sky-high. For Benn and Seguin in particular, the pressure is on.